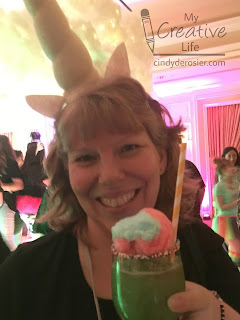 In the wrap-up about Snap Conference, I included a photo of me, my roommates, and two men dressed as unicorns. Unicorns served as the mascot for this year's conference. The highlight of our last night was a unicorn-themed dance party where we were encouraged to dress up as unicorns. I do not own a unicorn costume, nor did I want to dedicate precious luggage space to bringing something big. 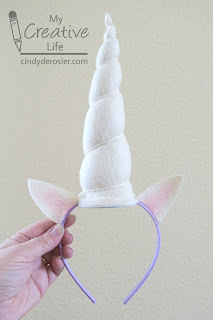 So I made a unicorn headband. 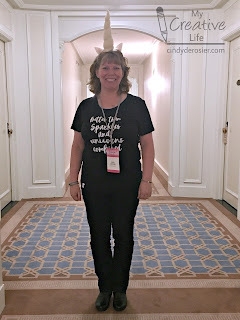 Paired with the official conference t-shirt by Cents of Style ("better than sparkles and unicorns combined"), it was perfect for the party. Here's how it looks when I'm not wearing it. 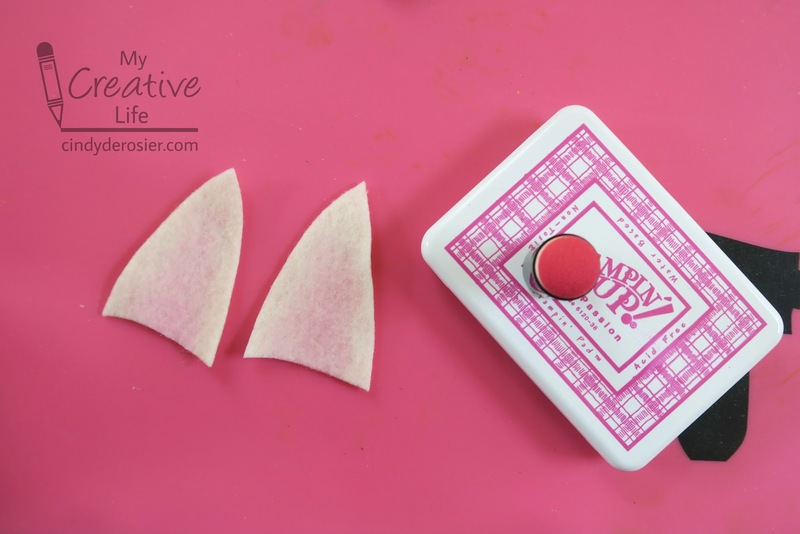 Roll the felt into a cone shape that is the height you want. Trim the extra material and use hot glue to secure the cone. Stuff the cone with polyfil, being sure to push it all the way to the tip of the horn. Glue a scrap of felt to the bottom of the cone to hold the polyfil in place, then trim it even with the cone. Use the hot glue gun helpers kit to protect your tabletop and your fingers. That thing is a godsend. 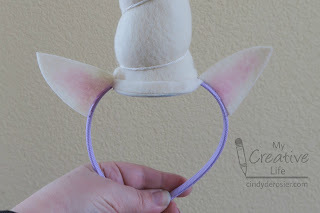 Glue a piece of embroidery floss to the tip of the horn. Wind it down the horn to make a spiral, pulling tight to get the shape you want. Secure it with glue at the bottom. Set the horn aside. Cut two matching triangles from the felt scraps to make ears. Dab them with pink ink in the centers. Set them aside. Glue the horn to the headband. Add a scrap of felt underneath to trap the headband securely. Then glue the metal juice lid to the underside of the horn, making sure to put glue on the entire surface. This is what will stabilize the horn and prevent it from tipping or wobbling. I chose to paint mine, but that was completely unnecessary, as it ends up hidden. 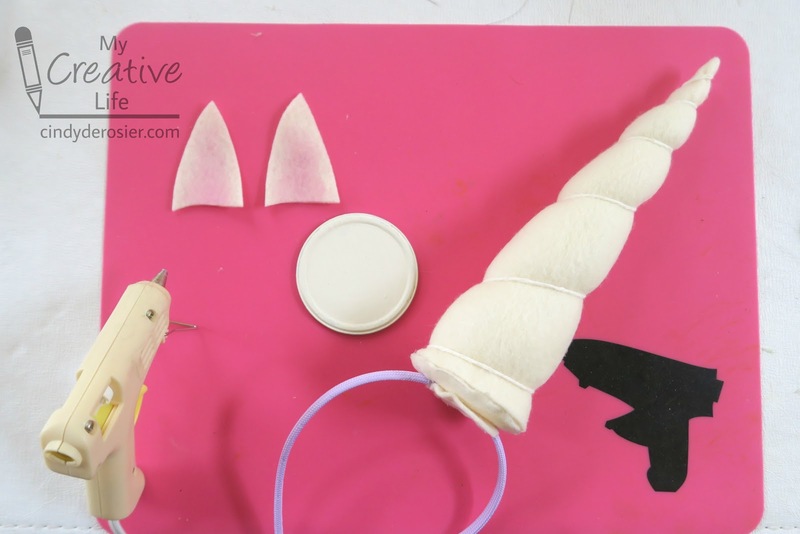 Finally, glue one ear on each side of the horn, making sure that the pink fronts are on the opposite side of the horn's seam. Perfect for any unicorn-themed occasion! This is awesome! I loveeeeeeeeeeeee it!!!!!!!!!!!!!!!!!!!!!!! My Trendiest Birthday Gift Ever!